This month’s newsletter contains a preview of IPSI involvement in the upcoming CBD SBSTTA-21 and WG8J-10 meetings, as well as a report from a recent round table related to the Bio-Bridge Initiative in Uganda. We have also received news of the latest GEF-Satoyama Project newsletter, and an introduction to one of IPSI’s newest members, Shumei International. The IPSI Secretariat is looking forward to taking part in two upcoming meetings under the processes of the Convention on Biological Diversity (CBD): the Twenty-first Meeting of the Subsidiary Body on Scientific, Technical and Technological Advice (SBSTTA-21) from 11 to 14 December, and the Tenth meeting of the Ad Hoc Open-ended Working Group on Article 8(j) and Related Provisions of the Convention (WG8J 10) from 13 to 16 December in Montreal, Canada. • Monday, 11 December (13:15, JUSCANZ Meeting Room): “Integrated Landscape Management in the UN Decade of Biodiversity 2010-2020 and Beyond: Achievements and Future Direction of the International Partnership for the Satoyama Initiative (IPSI)”, organized by the IPSI Secretariat along with the Ministry of the Environment, Japan, the Ghana National Biodiversity Committee and the Ministry of Forest and Soil Conservation, Nepal. • Tuesday, 12 December (18:15, JUSCANZ Meeting Room): “Indicators of Resilience in Socio-ecological Production Landscapes and Seascapes: practice on the ground and contribution to Aichi Biodiversity Targets”, organized by Conservation International and UNDP. • Thursday, 14 December (13:15, Africa Meeting Room): “Community Action to Achieve the Aichi Targets COMDEKS Contribution”, organized by UNDP, UNU-IAS and the Ministry of the Environment, Japan. We hope that any IPSI partners who will be at these meetings will be able to attend the side events. Also, please take the time to write a quick message and let us know if you will be there, and if you have plans including any more side events, as we hope to meet up with many IPSI partners while we are in Montreal. More information about the side events can be found on the CBD website here. A regional round table for the Bio-Bridge Initiative was held for the African region from 7 to 9 November in Entebbe, Uganda as part of a planned series of regional round tables intended to raise awareness of the Bio-Bridge Initiative and explore its potential future including cooperation with other initiatives and mechanisms. To help explore possible synergies between the Bio-Bridge Initiative and the Satoyama Initiative, the IPSI Secretariat’s Mr. Yohsuke Amano traveled to the round table to give a presentation and serve as panelist. The Bio-Bridge Initiative was established by the Government of the Republic of Korea “to promote and facilitate technical and scientific cooperation under the Convention and its Protocols with a view to enhancing the implementation of the Strategic Plan for Biodiversity 2011-2020 and its Aichi Biodiversity Targets as well as the updated national biodiversity strategies and action plans”, by linking Parties to the CBD that need technical and scientific assistance with those that can provide it. The Initiative was launched and recognized at CBD COP 12 in Pyeongchang, Republic of Korea in 2014. 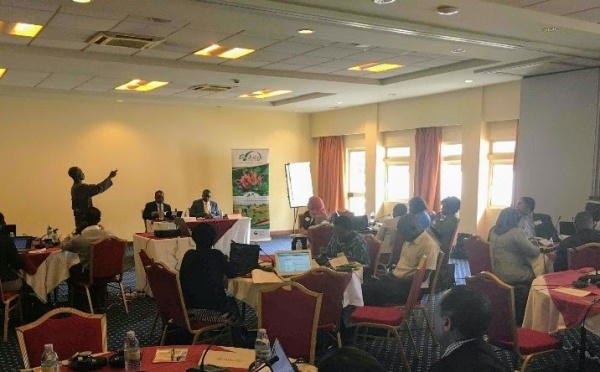 The round table consisted of a number of presentations and panel sessions over the three days, and is expected to provide a good start for Bio-Bridge Initiative operations in Africa. It will be followed by more round tables, currently planned for Latin America and Eastern Europe later this year. For more information on the Bio-Bridge Initiative, its regional round tables and other activities, see the CBD website here. The IPSI collaborative activity “Mainstreaming Biodiversity Conservation and Sustainable Management in Priority Socio-ecological Production Landscapes and Seascapes”, known as the “GEF-Satoyama Project” is an effort to “achieve societies in harmony with nature, with sustainable primary production sector based on traditional and modern wisdom, and making significant contributions to global targets for conservation of biological diversity” by working in targeted biodiversity hotspots around the world. The project is funded by the Global Environment Facility (GEF), implemented by Conservation International’s CI-GEF Project Agency and executed by Conservation International Japan in cooperation with the United Nations University Institute for the Advanced Study of Sustainability (UNU-IAS, the Secretariat of the International Partnership for the Satoyama Initiative) and Institute for Global Environmental Strategies (IGES). 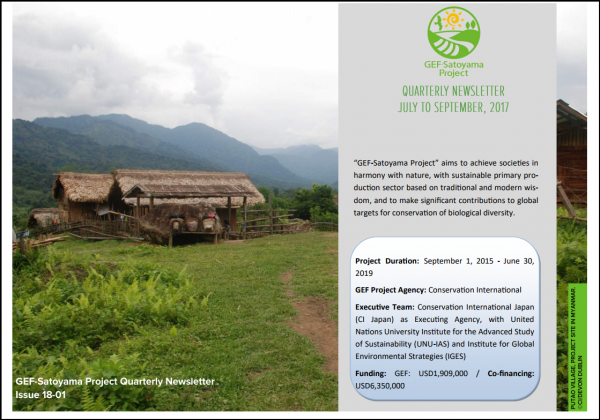 The GEF-Satoyama Project recently produced its third quarterly newsletter, including updates from project components and reports of the recent thematic track session at ISAP2017 in July and workshop on gender mainstreaming in September. The newsletter is available on the GEF-Satoyama Project website here. Shumei International is a nonprofit organization based in Japan that aims to contribute to creating a peaceful world in harmony with nature, and as of the IPSI Steering Committee meeting in October of this year, one of IPSI’s newest members. We hope readers will join us in welcoming them to the partnership. Shumei develops and engages in ecological farming projects and programs worldwide, including community-supported agriculture (CSA), to foster a shift to sustainable food systems and advance natural solutions to climate change. Program elements include capacity building and training in ecosystem management, the preservation of biodiversity and indigenous knowledge as well as highlighting the importance of soil health and the use of indigenous seed. Shumei also focuses on educating the public on sustainable lifestyles and living in harmony with nature. Since 2003, Shumei has created partnerships with small holder farmers, farming cooperatives and organizations around the world. For example, Shumei partners with the Natural Agriculture Development Program Zambia to assist thousands of rural women farmers in the transition to ecological farming methods that improve food security and their ability to mitigate climate change. For more information on Shumei International, please visit their website here.